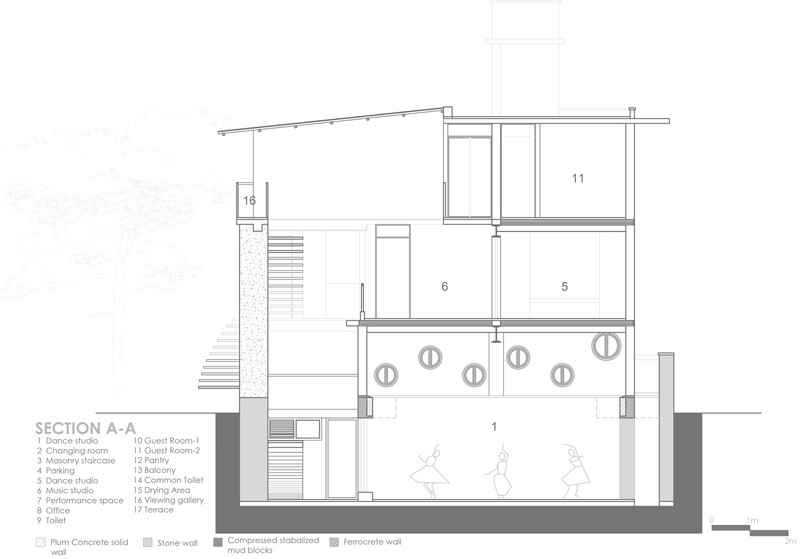 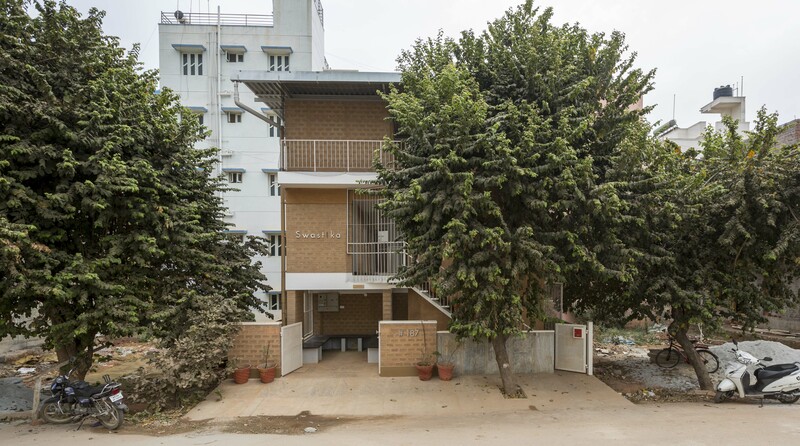 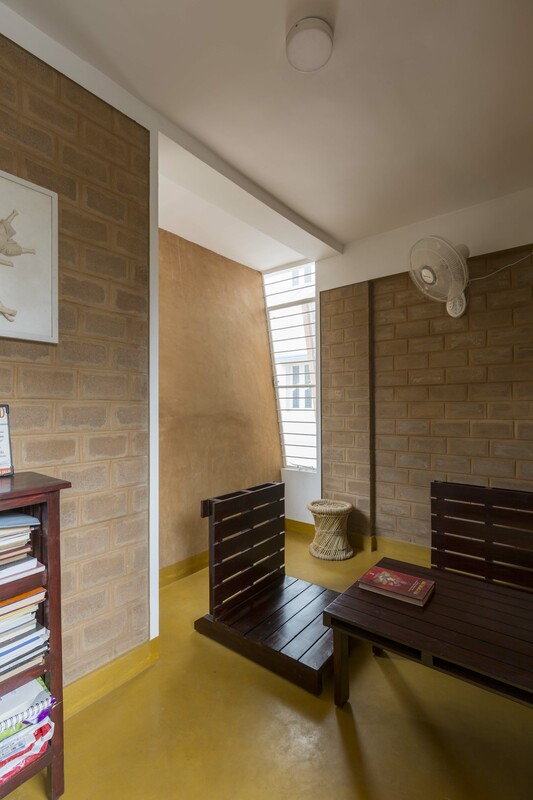 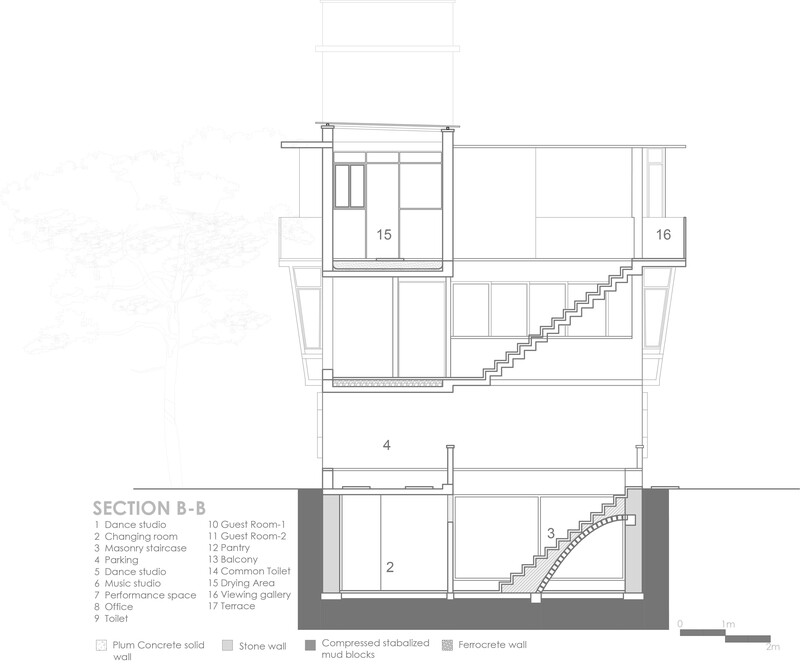 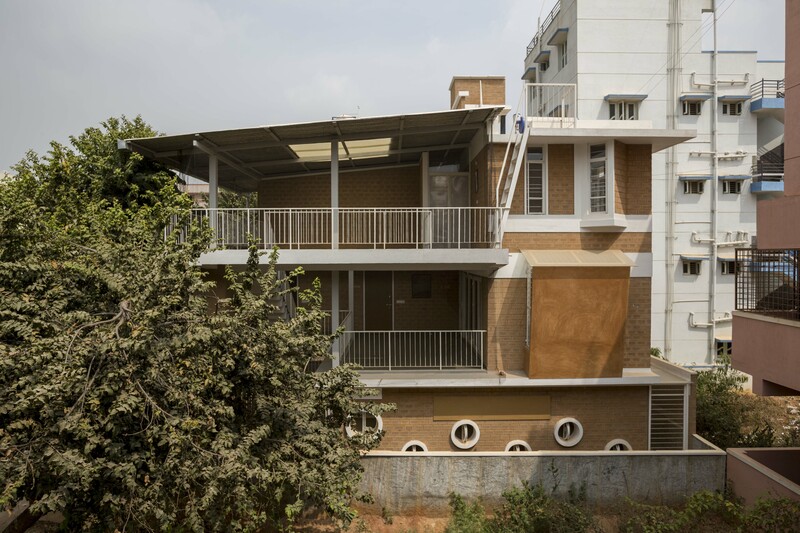 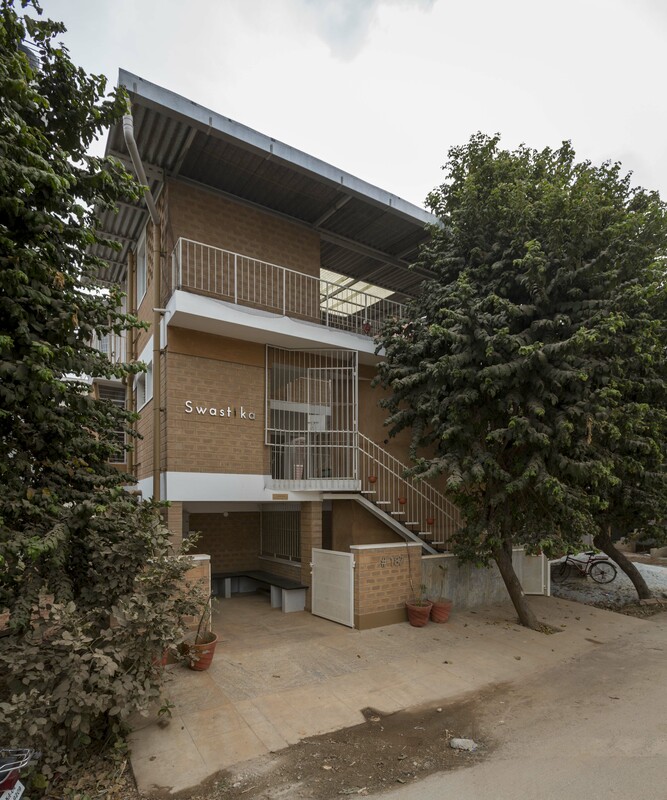 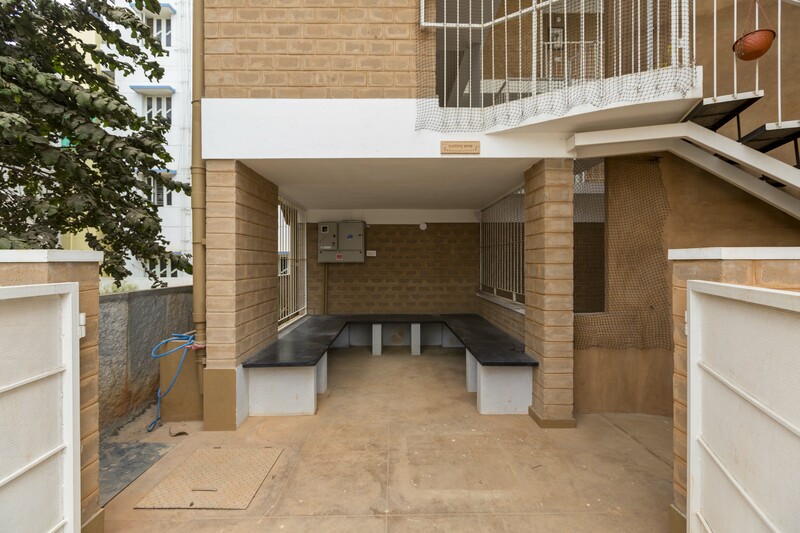 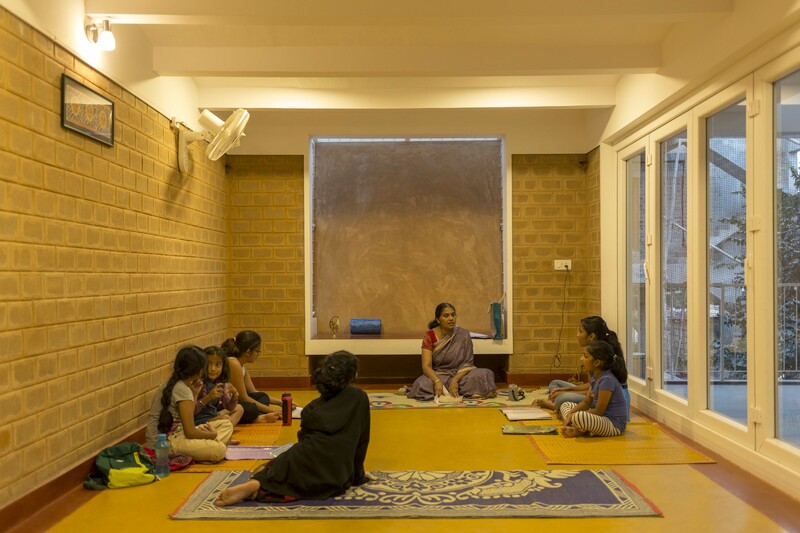 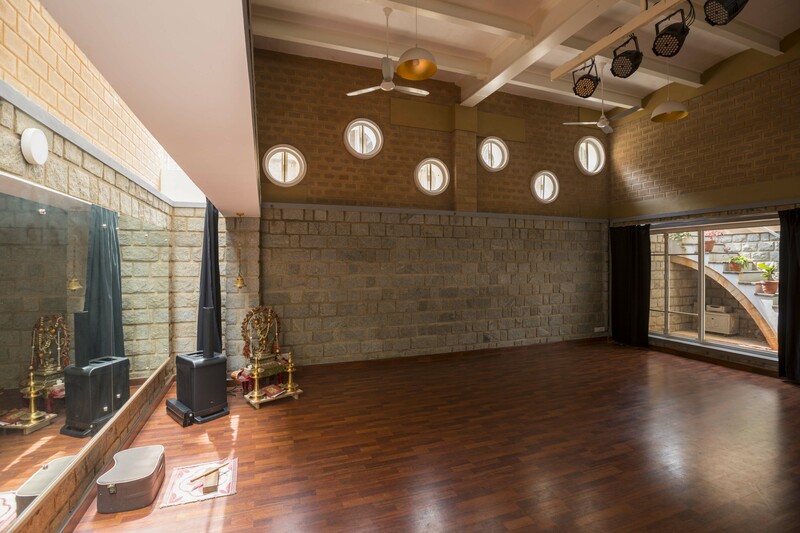 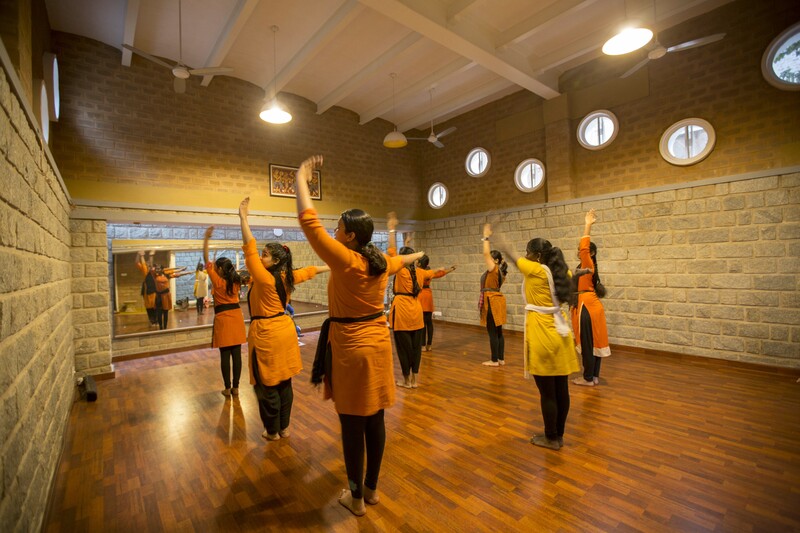 The brief given to Bioem Environmental Solutions was to design a dance and music studio with an intimate platform for performing arts on a small plot in Bangalore, that would also serve as a venue for workshops and small events at times. 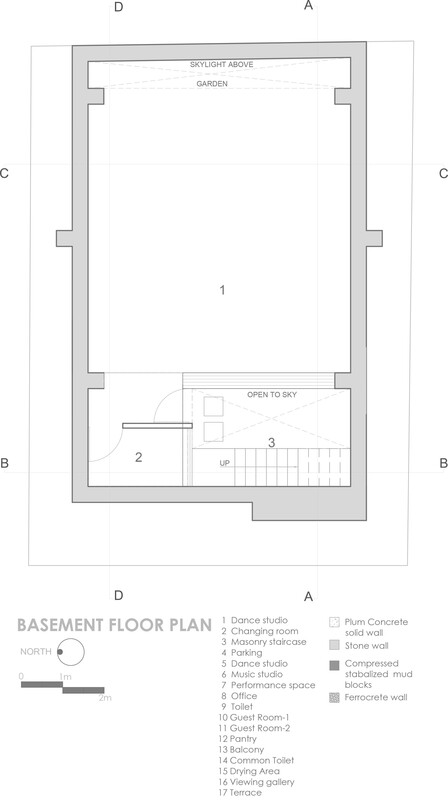 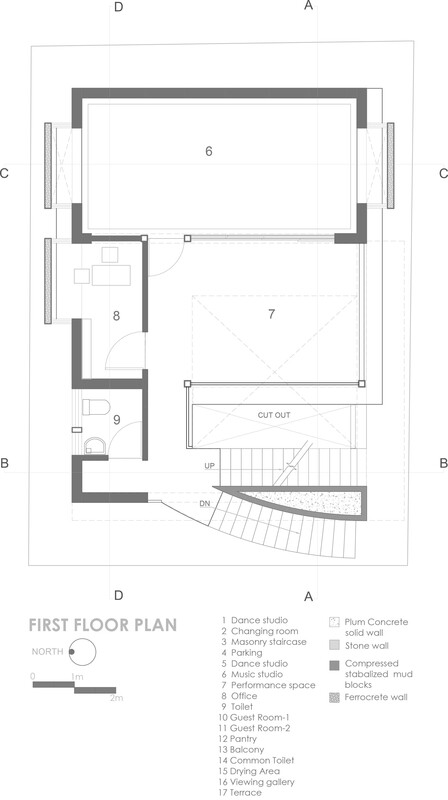 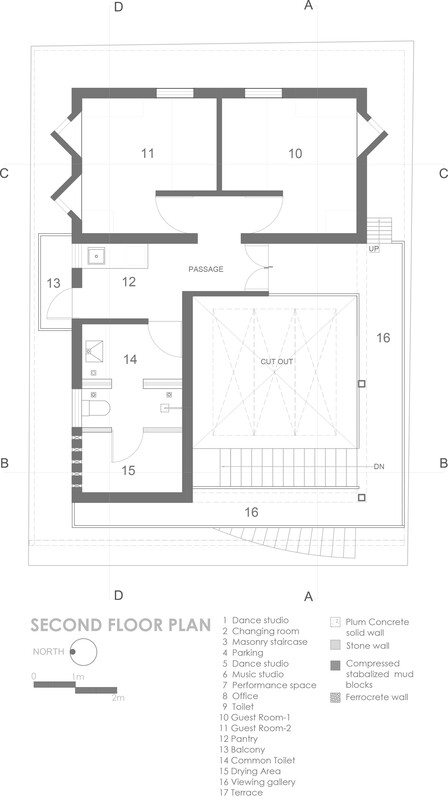 The challenges of a tight site and requirements led to a design where each space and element played more than one role. 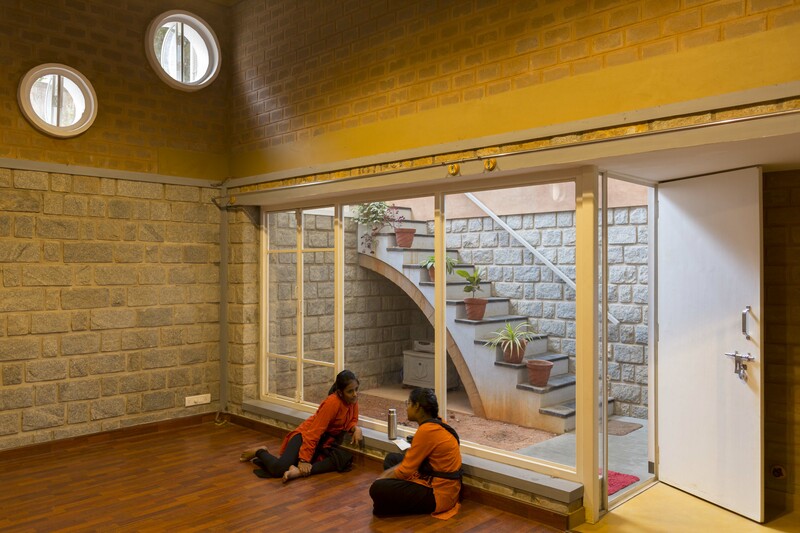 Partially sinking the building allowed the double height volume required for the dance studio to be accommodated while being acoustically sound, without compromising on light and ventilation. 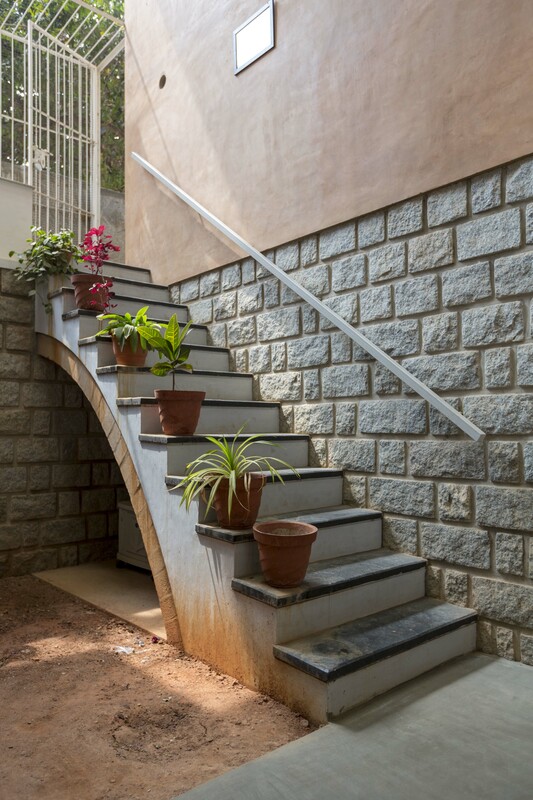 It also provided the soil necessary to make the stabilised mud bricks used to build the structure. 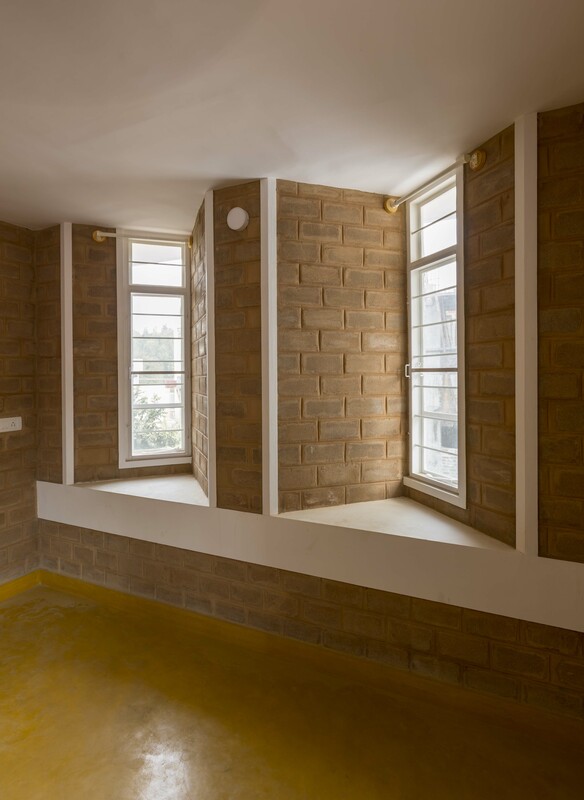 A narrow skylight at the east and precast concrete rings windows create play of light in the studio through the day. 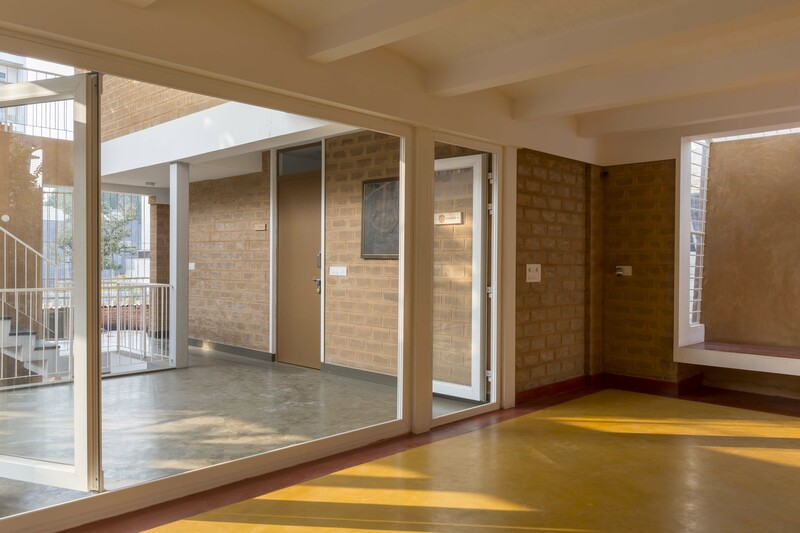 Additional light pours in through a common front court, which connects all three levels of the studio and makes the space interactive during performances and events. 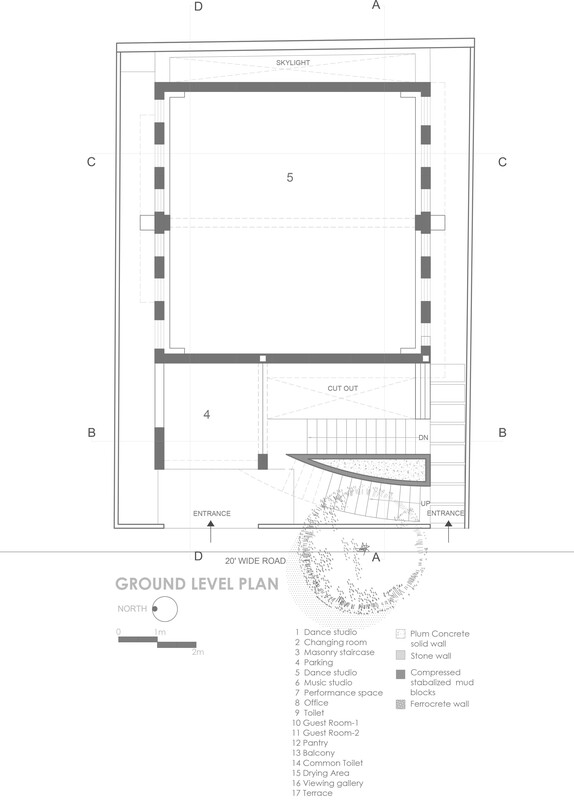 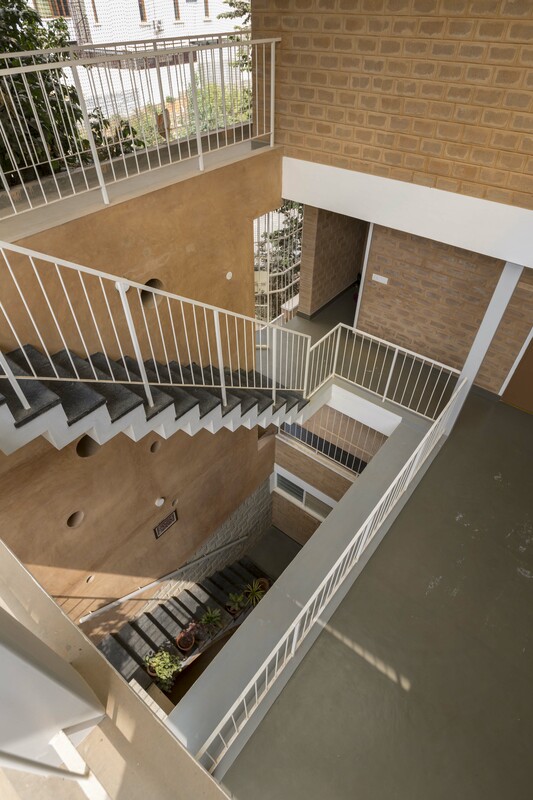 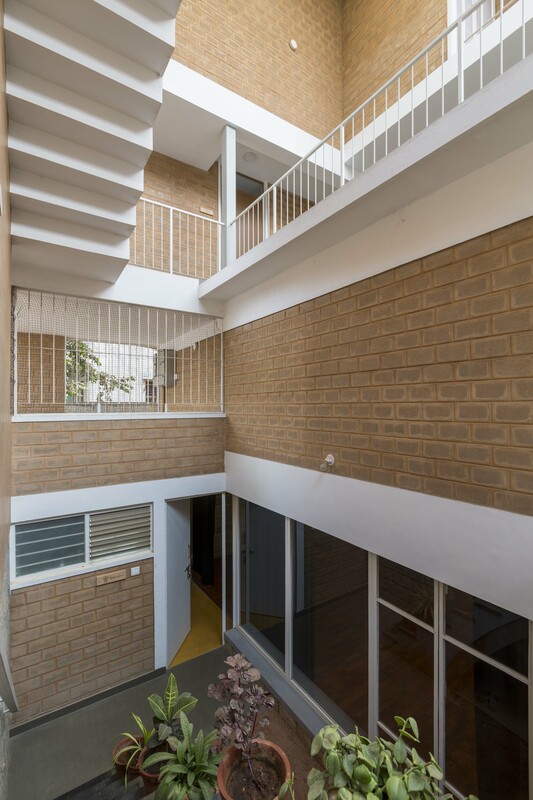 From the studio, a staircase supported on a brick vault leads to the ground level, where the car park serves as a temporary waiting area for parents of students. 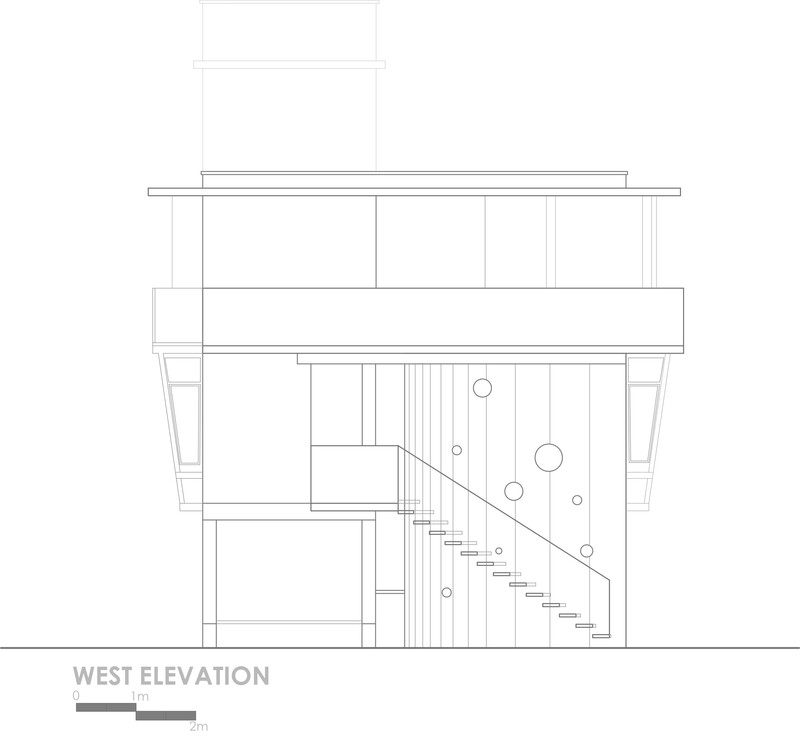 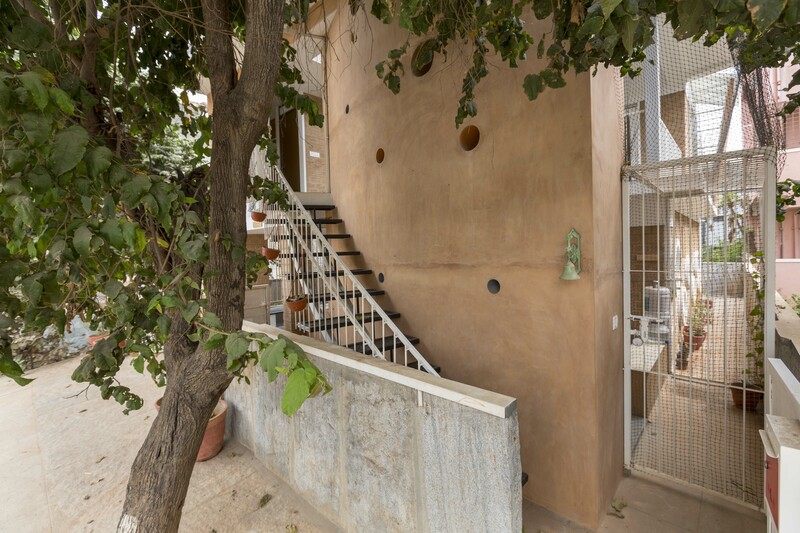 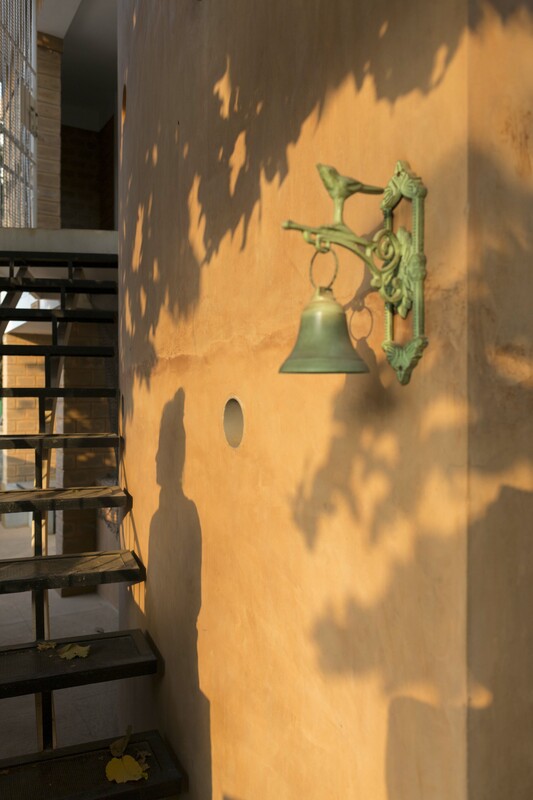 The solid central core of the staircase, made with mud rendered plum concrete using construction debris as aggregate and cylindrical openings, forms a strong element of the facade along with the West Indian elm tree at the entrance. 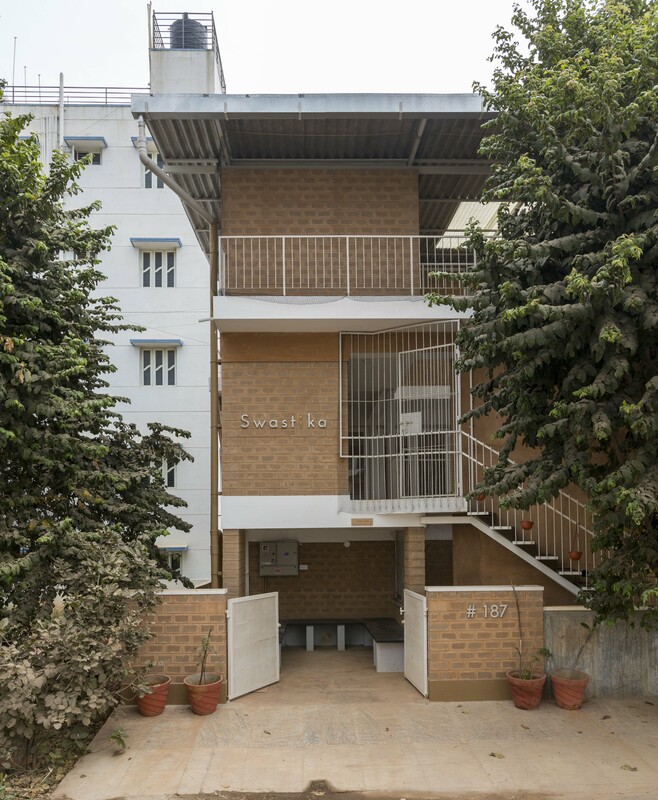 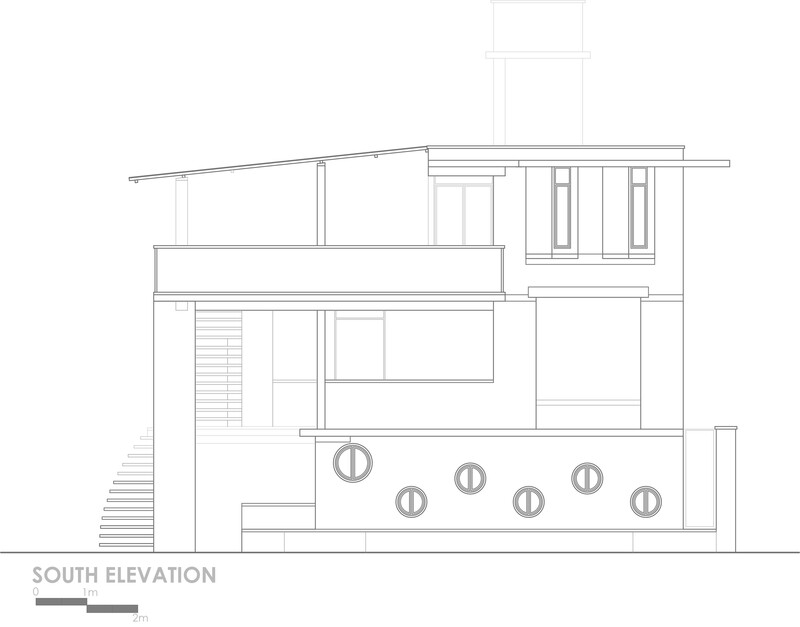 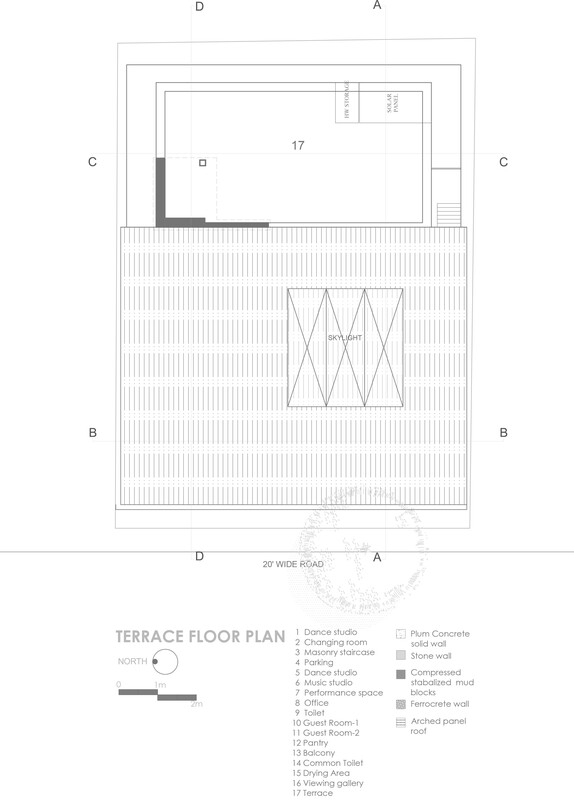 A metal staircase curves around this core to the first floor level, which comprises of a music studio, an outdoor platform, an office, and a common washroom. 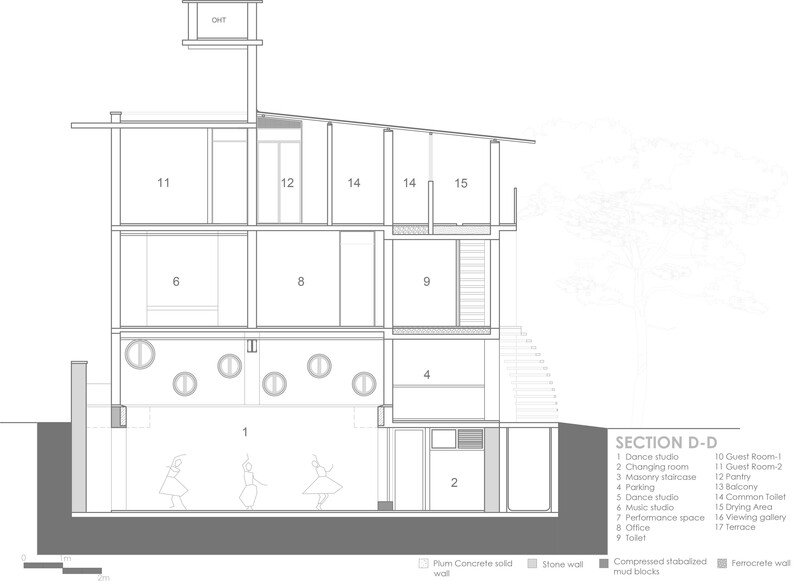 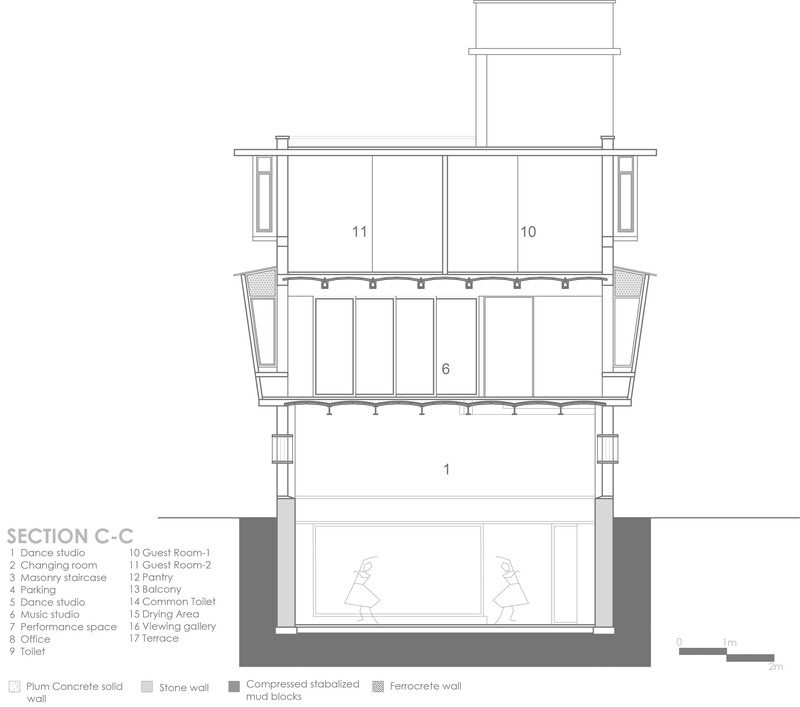 The music studio and the platform are separated by full height glazing, that opens up to become a larger performance space. 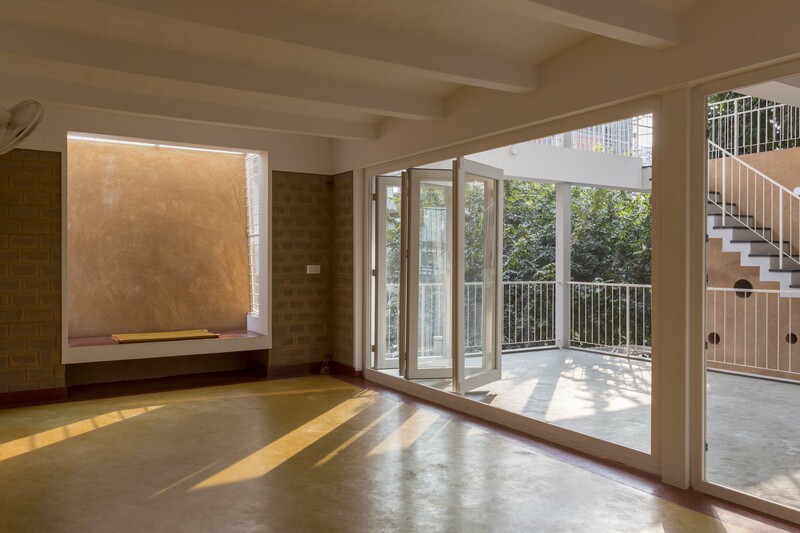 This double height open space is shaded by a sloping roof made of processed tetra pack corrugated sheets with a central skylight. 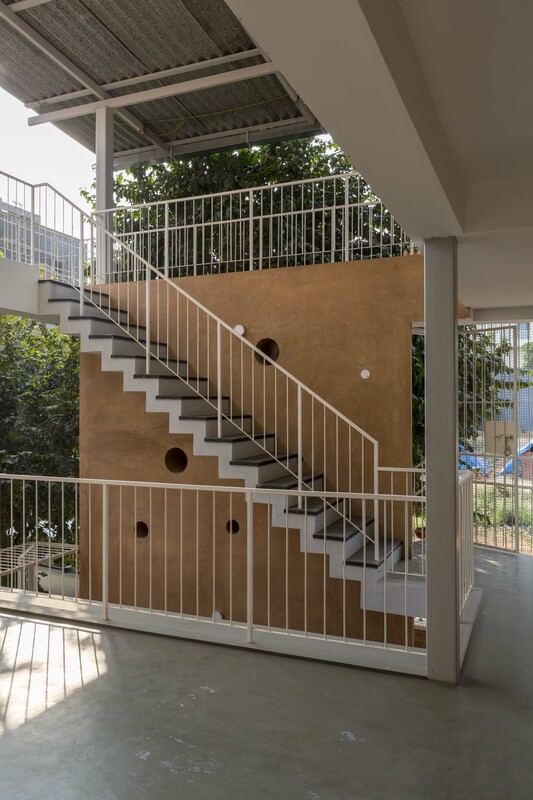 Rainwater from the roof is harvested and reused for the studio’s requirements. 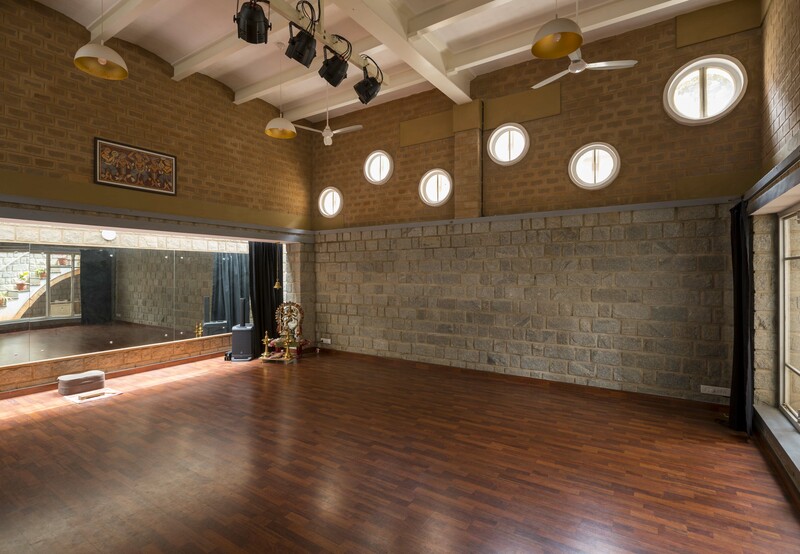 A gallery on the second floor overlooks the performance area, and serves as a passage to guest suites for visiting trainers of dance, music and yoga. 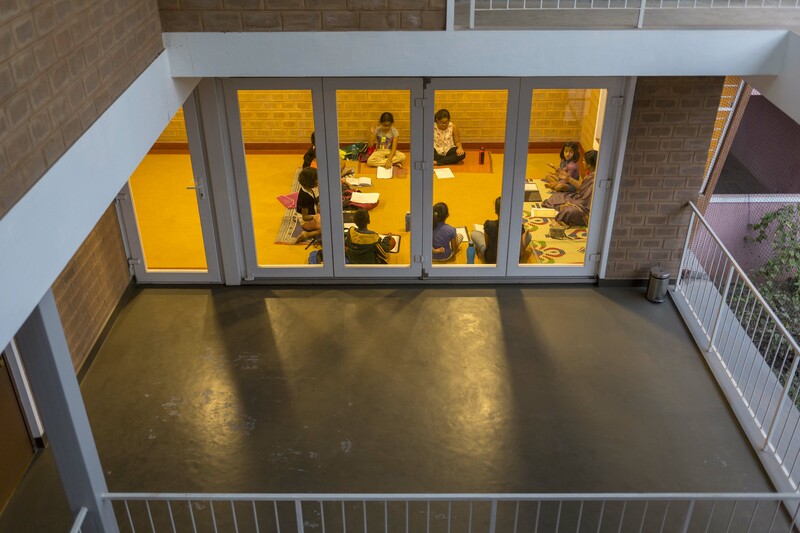 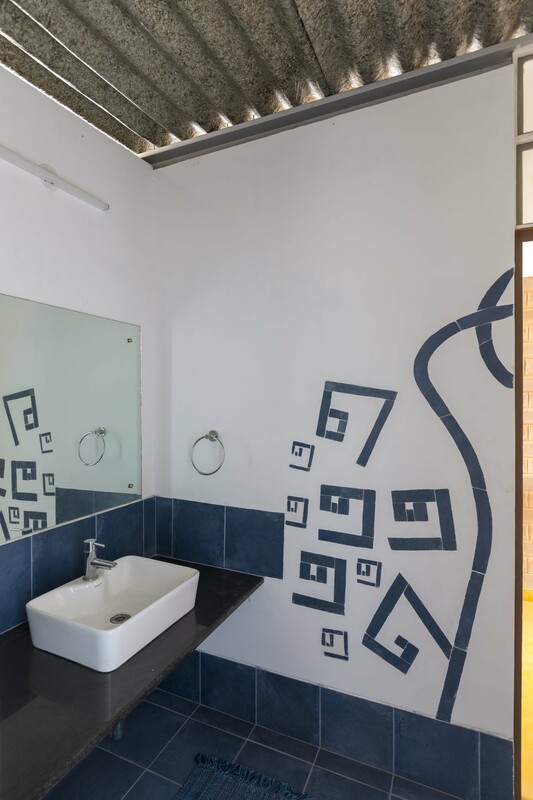 The vertical connectivity between the three levels was brought in through the triple height front court creating an opportunity for lively interaction among students in a stimulating open environment.